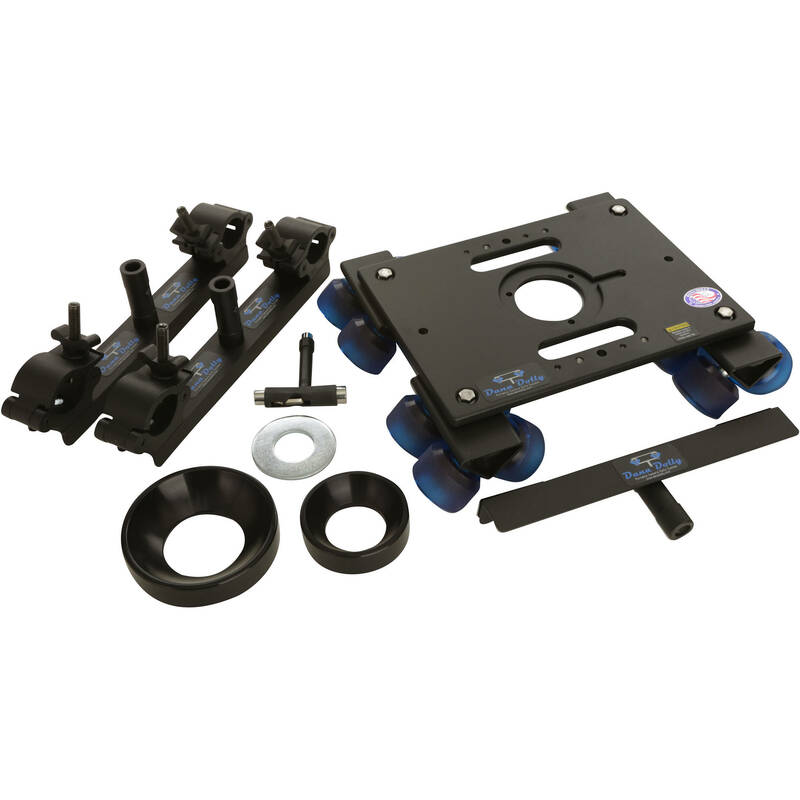 The Dana Dolly Portable Dolly System with 100 & 150mm bowl adapters and universal track ends is a heavy duty camera dolly platform that rides on 16 custom modified soft polyurethane wheels that resist flat spotting and use ABEC-7 rated precision bearings providing you with extremely smooth dolly shots. The wheel trucks swivel, allowing the dolly to ride on available straight or curved track, which you must source separately. The manufacturer recommends using standard speed rail or Schedule 80 aluminum pipe of compatible size. The dolly includes two universal track ends, which accept inch and a quarter pipe (standard speed rail) up to 1.9" O.D., and fit into available standard Junior stand receivers or 5/8" Baby pins. A center support is included for long track runs or when using heavy cameras. The dolly platform is machined from aluminum and features a standard Mitchell mount including a 2.75" center hole with a machined key way. The included 100mm and 150mm bowl adapters allow you to mount fluid heads with standard 100mm or 150mm leveling balls. The platform incorporates one 3/8" through hole, one 1/4"-20 threaded hole, and one 3/8"-16 threaded hole on each side of the dolly platform for a total of 6 accessory mounting holes. The Dana Dolly is designed and manufactured in the USA. The wheel trucks can swivel on the dolly, which allows it to ride on straight and round track. The included T-Tool features a 1/2, 9/16, and 3/8" ends. It allows you to tighten the wheel trucks using the 9/16th end to suit your taste. The Mitchell mount features an elongated key way, allowing you to use non standard adapters. Box Dimensions (LxWxH) 20.32 x 20.3 x 9.0"
Portable Dolly System with Universal Track Ends, 100 & 150mm Bowl Adapters is rated 5.0 out of 5 by 1. Rated 5 out of 5 by Matt from Great Product! I absolutely love my Dana Dolly! I use it with light weight cameras on cheap conduit from Home Depot. The Matthews Low Boy Combo stands work great with this and offers lots of versatility. If you plan to use a heavy camera, you will need a center support stand, but since my cameras are small, it works fine for me to just use two stands, one at each end.I did not purchase a case when I purchased this, and have just been using the box that it came in. I would recommend that you get a case for this when you purchase it. In the end, this is a great product, and if you are considering it, you should get it. I've only had it for a month and used it about 40 times, so in rental fees, I have totally gotten my money out of it.